Chrome URLs are internal pages of the Google Chrome browser designed mostly to provide developers and advanced users with detailed information about the browser's internals. Just like Mozilla Firefox or Opera, Google Chrome ships with a set of internal URLs that you can access for various purposes. From displaying internal information to downloads, looking up crashes or the browser's experimental features that you can enable to test them out, there is something available for anyone here. But which pages are available, and what purpose do they serve? The first thing that you need to know is that all Chrome URLs begin with chrome:// followed by one or multiple words afterwards. Multiple words are always hyphenated and URLs never include spaces or special chars in them. You can display the list of Chrome URLs by loading chrome://chrome-urls/ in the browser. While that gives you a list of available pages, it won't provide you with information on what purpose they serve, and not all pages that are available actually. You can obviously load them one by one to find out, or look at the list below for faster results. chrome://about -- lists all internal Chrome URLs. chrome://accessibility - Displays accessibility information for each tab open in the browser, and whether the feature is turned on globally. chrome://appcache-internals - Information about appcached sites, including how much space they use. chrome://apps/ - Lists all installed applications (by user and those that ship with the Chrome browser on a new page. chrome://bluetooth-internals/ -- Displays information about connected Bluetooth adapters and devices, e.g. whether devices are presented and discoverable. chrome://chrome/ - Opens the about page. chrome://components/ - A list of internal components such as "chrome crash service" or "pepper flash", and options to check for updates for each individually. chrome://conflicts/ - Lists all modules loaded and reveals whether there are any conflicts. chrome://crashes/ - Displays information on recent crashes if crash reporting is enabled. chrome://device-log/ - Shows a log of device related events. chrome://devices/ - Lists physical or virtual devices connected to Chrome. Option to add printers to Google Cloud Print. chrome://dino -- Displays the "there is no Internet connection" error page. chrome://discards/ - Information about tabs that were discarded during the session. Options to discard individual tabs from the page. chrome://download-internals -- Start downloads and monitor responses and the process. chrome://gcm-internals/ - Displays Google Cloud Messaging information. chrome://help/ - Opens the about page. chrome://history - Opens the browsing history page with options to clear the browsing history or look through it to find a page that you have opened in the past. chrome://indexeddb-internals/ - IndexedDB information in the user profile. chrome://interventions-internals -- Lists the intervention status, flags, logs, and other information. chrome://local-state/ - Lists features and whether they are enabled or not in the local browser, also state information. chrome://media-engagement -- Displays the media engagement score and thresholds for all sites opened in the browser. The score is used to determine video autoplay with sound. chrome://network-error/ - Displays the network error message. chrome://network-errors/ - Displays the list of network error messages that Chrome may throw. chrome://ntp-tiles-internals -- Displays information about the tiles on the New Tab page and the Top sites functionality. chrome://password-manager-internals/ - Password manager logs are listed on the page. Logs are cleared automatically when the page is closed. chrome://safe-browsing -- currently under construction. Displays Safe Browsing status. chrome://serviceworker-internals/ - Lists all Service Workers registered by the browser, and options to unregister. chrome://settings - Opens the main Chrome Settings' page. chrome://signin-internals -- Displays inforamtion about the signed in account(s) such as last signin details or validity. chrome://site-engagement -- Dispalys an engagement score for all sites visited in the browser. hrome://suggestions/ - All New Tab page suggestions, and when they expire. chrome://supervised-user-internals/ -- Lists information about the active user, and gives administrators options to test website filters and other things. chrome://sync-internals - Detailed information about the browser's synchronization feature if enabled. 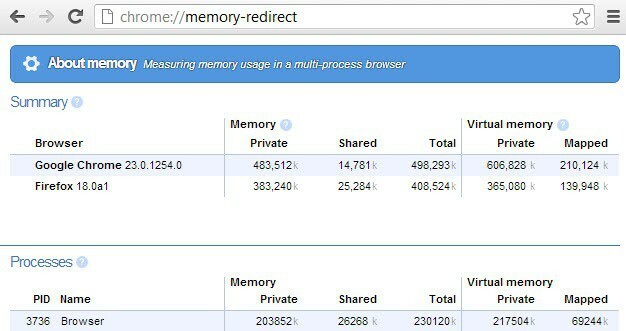 chrome://system/ - Lists JSON information about the system, sync, memory usage and more. chrome://taskscheduler-internals -- Lists task scheduler internals. chrome://thumbnails/ - All top sites urls with and without thumbnails. chrome://translate-internals/ - Translation information that include supported languages, which languages get never or always translated, and logs. chrome;//usb-internals -- Add and test USB devices connected to the computer. chrome://user-actions/ - A log of user actions, e.g. close tab, change tab and so on. chrome://webrtc-internals/ - Create a dump by downloading PeerConnection updates and stats data. chrome://webrtc-logs/ - Lists recently captured WebRTC logs. And then we have the following Chrome URLs listed for debug purposes only. These are designed to crash or hang the renderer. chrome://inducebrowsercrashforrealz/ -- Crashes the browser. chrome://copresence/ - Information about the Copresence service (active directives, tokens transmitted and received) which enables Chrome to communicate with nearby devices. chrome://memory-internals/ - Detailed memory information about each tab open, the browser and gpu process, and JSON information. chrome://signin-internals/- Displays sign-in related information, e.g. last sign in, basic information and access tokens. chrome://profiler - Profile tracking information, only useful to developers. chrome://view-http-cache - Displays web pages that you have accessed, or were accessed while you were browsing on the Internet. Not all Chrome URLs are useful to non-developers, but some let you access features that you would not be able to access otherwise. If you access an internal page regularly, you may want to bookmark it in the browser to speed that process up. Please note that pages come and go, and that some of the pages may be removed or altered in upcoming versions of the browser. If you spot any issues, know of pages that are not on the list, or errors in descriptions, feel free to leave a comment below so that I can correct the list for everyone's benefit. The page lists all internal chrome:// urls for fast access, and a description of the functionality of each chrome page. Strange, I do not. Which version of Chrome do you run? I can see the histograms page/report using 22.0.1229.26 beta-m.
I’m running the latest Canary version. Hi, I’m using version 21.0.1180.83 m of Google Chrome, and I’m able to see it. Bookmarked, These are useful information. Chrome is my main browser even it crashes sometimes. I also use the chrome engine in Avant browser. These urls also work there.Cool. chrome//plugins does not seem to exist any more. I have not been able to access it on more than one computer. I made a Chrome extension that features many of these hidden pages: https://chrome.google.com/webstore/detail/hiddenchrome-free/jhcdplpmjpchlfjfihdpimbakifjnnda.